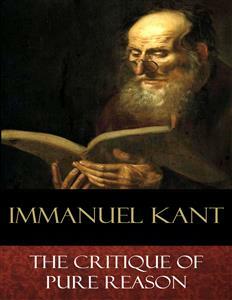 The Critique of Pure Reason is a book by Immanuel Kant that is considered one of the most influential works in the history of philosophy.This edition was translated by John M. D. Meiklejohn (1836-1902).Dealing with questions concerning the foundations and extent of human knowledge, Kant builds on the work of empiricist philosophers such as John Locke and David Hume, as well as taking into account the theories of rationalist philosophers such as Gottfried Wilhelm Leibniz and Christian Wolff. Kant expounds new ideas on the nature of space and time, and claims to solve the problem which Hume posed regarding human knowledge of the relation of cause and effect, and to have assessed the ability of the human mind to engage in metaphysics.Knowledge independent of experience is referred to by Kant as "a priori" knowledge, while knowledge obtained through experience is termed "a posteriori". According to Kant, "a priori" knowledge expresses necessary truths. Statements which are necessarily true cannot be negated without becoming false. Examples provided by Kant include the propositions of mathematics, propositions "from the understanding in its quite ordinary employment", such as "Every alteration must have a cause", as well as propositions from "natural science (physics)", such as "in all changes in the material world the quantity of matter remains unchanged".Immanuel Kant (1724–1804) was a German philosopher who is considered a central figure in modern philosophy. Kant argued that the human mind creates the structure of human experience, that reason is the source of morality, that aesthetics arises from a faculty of disinterested judgment, that space and time are forms of our sensibility, and that the world as it is "in-itself" is independent of our concepts of it. Kant took himself to have effected a Copernican revolution in philosophy, akin to Copernicus' reversal of the age-old belief that the sun revolved around the earth. His beliefs continue to have a major influence on contemporary philosophy, especially the fields of metaphysics, epistemology, ethics, political theory, and aesthetics.Kant in his critical phase sought to 'reverse' the orientation of pre-critical philosophy by showing how the traditional problems of metaphysics can be overcome by supposing that the agreement between reality and the concepts we use to conceive it arises not because our mental concepts have come to passively mirror reality, but because reality must conform to the human mind's active concepts to be conceivable and at all possible for us to experience. Kant thus regarded the basic categories of the human mind as the transcendental "condition of possibility" for any experience.